Here at day block, we don’t believe in decisions. Whether you’re looking for a refreshing break during the Minnesota summer heat, a sizzling good bite to eat or a pick-me-up Sunday morning, we’ve got a flight for you. 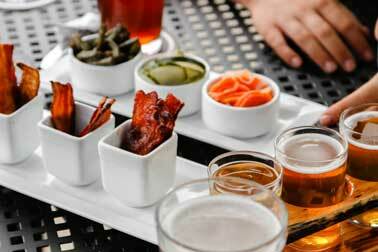 Without further or do, let us introduce you to our - Beer, Bacon & Bloody (plus a few more) Flights. 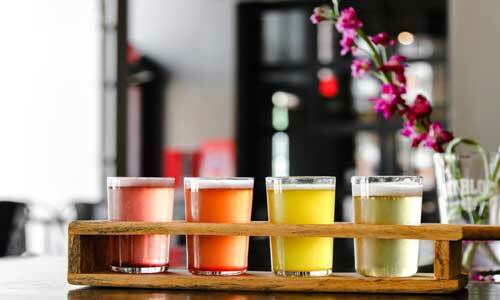 You’ve never seen food & drinks take flight like this before. Why pick one beer when you could have six. Get a taste of what truly makes us the brewpub that we are. Our beers tell the stories of the building, brewing process and handcrafted to give you the best Minneapolis experience. This is accomplished by our brewer’s carefully combining ingredients while working within our community as they bring new ideas to life. 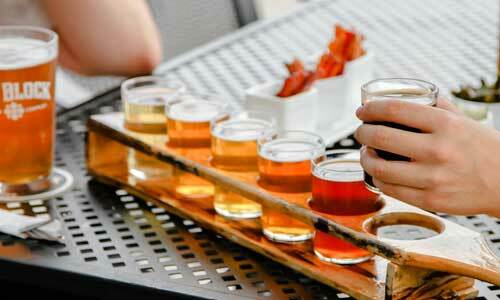 Have the true Day Block experience by giving our craft beer flight a shot, you won't be sorry. 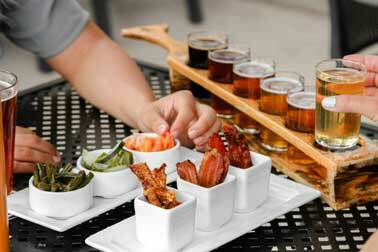 * Our weekly date night deal gets you a lot for a little - including a beer flight for you and a special someone. Check out our weekly and monthly events to see how you can score at our Minneapolis brewery. We take bacon seriously. No really. We even throw an annual Porktoberfest, an outdoor live music celebration, every year to honor our bacon roots. 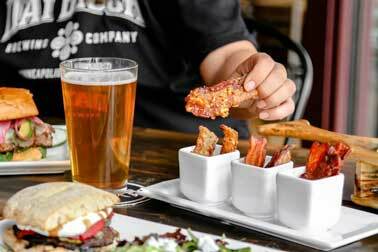 Our bacon flight is a daily selection of locally sourced bacon presented with a complementary sauce. Each bacon strip and sauce mends new flavors and pushes the barriers. 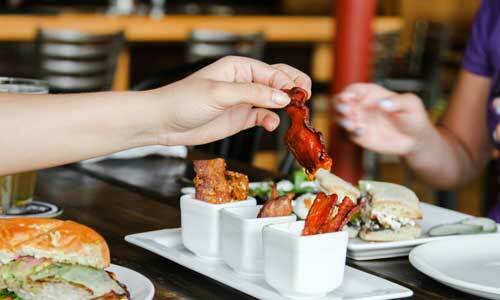 The Day Block Bacon Flight - if only pigs could fly...wait a second. Hair of the dog. Aids in digestion. Whatever it may be, we've got just the thing. 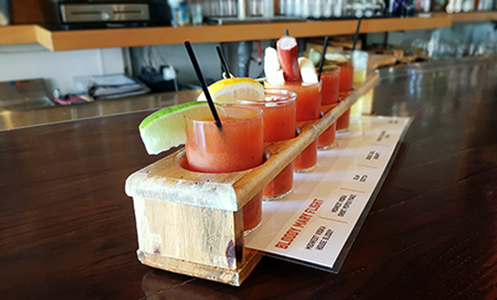 Why have just one when you could have a whole flight of bloody marys, each made with infused vodka flavors. Giving you five changes to find the best Bloody Mary in Minneapolis. With a full-service bar, our bartenders handcraft cocktails for any occasion. And we all know bloody’s are the answer to all occasions. We all have that one friend who’s pickle obsessed. This one's for them. 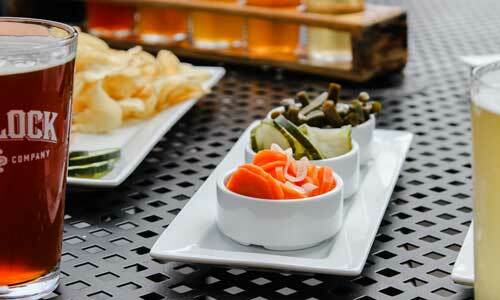 Our pickle flight's a daily selection of house-pickled veggies - a perfect addition to any pizza and beer combo. Oh, & don't forget to catch this flight on happy hour every Monday - Friday from 2-6pm! We'll provide the true minnesotan experience for your afterwork relaxation or late lunch meet-ups, with daily happy hour specials. As lakes are to Minnesota, this Berliner Weisse Flight is to Day Block springtime. We can always rely on it being a good time and full…of good flavor. Our Berliner Weisse flights are served w/ a variety of house-made syrups available whenever our Berliner Weisse is on tap. Check out our current beers on tap to see if when this flight is available! If one orders three separate pizzas and lines them up in a row, can they count that as a pizza flight? You decide. 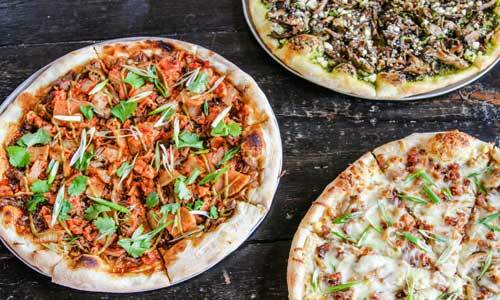 Pick from a variety of hand-crafted pizzas and "build your own pizza flight" for you and your table. A family-friendly option perfect for post-concerts at US Bank Stadium or pre-theater shows at the Guthrie down the way. Learn why our pizza puts Minneapolis pizza on the map and why it should be apart of your next flight experience. Thinking about stopping in for a flight or two? Make a reservation today!